If you can imagine what a Group 5 racing Fiesta would look like with box arches and deep, ground hugging front spoiler, then this is probably as close as you will get to realising the idea behind this particular project. The aim is to produce a circuit racing renegade, but with all the modern day creature comforts retained. In effect the ultimate road car, within a set budget, that really is a joy to drive in every respect. Externally the car will still be recognisable as a Fiesta, but the differences from stock should be obvious. Expect to see a subtle paint job covering the car to tone down the mods somewhat and the interior side of things will be fitted with an equally tasteful theme. Don't get the impression that this is just a glassfibre excercise though, as under the skin, and in particular under the bonnet will be nestling a larger than stock mill, together with a heavy duty suspension kit and braking system. All this, using parts, I might add, which are currently available off the shelf from any one of the many Rallye Sport Dealers. 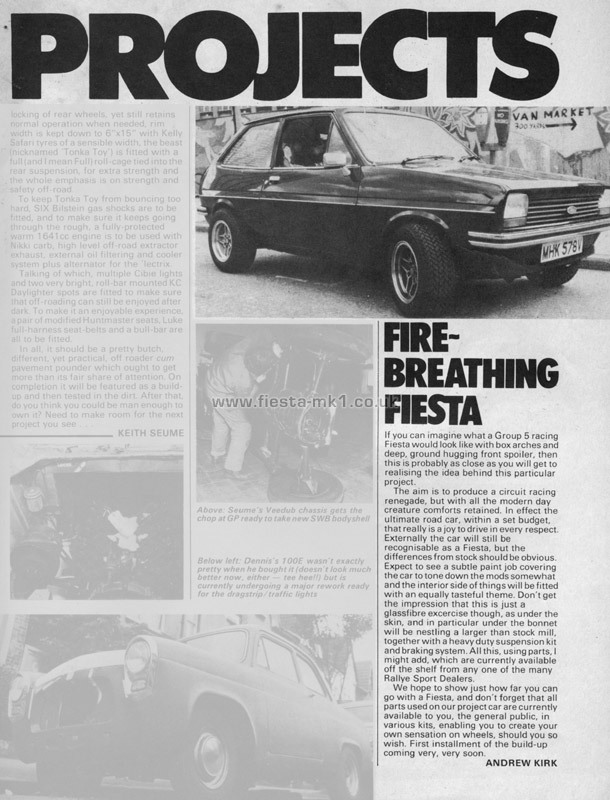 We hope to show just how far you can go with a Fiesta, and don't forget that all parts used on our project car are currently available to you, the general public, in various kits, enabling you to create your own sensation on wheels, should you so wish. First installment of the build-up coming very, very soon.